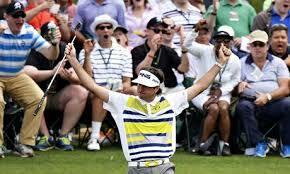 Bubba Watson plays the game like no one else. From the huge draws and fades he puts on nearly every shot to his often times emotional decision making (i.e., going for the green from the trees on the 15th hole with a 3-shot lead…), Bubba marches to the beat of his own drummer. And it is this willingness to play his own game that brings out his strengths. Use the strengths of your personality to your advantage. If you tend to wear your emotions on your sleeve, don’t put a bunch of energy into trying to stifle them – learn to channel that passion and energy into the right areas of your performance. The worst thing you can do as a competitor is attempt to be someone you’re not. Own your unique strengths and build them into your routine. A look at the final leaderboard this weekend reveals a surprising result – a handful of newcomers to Augusta outperformed their more seasoned counterparts. 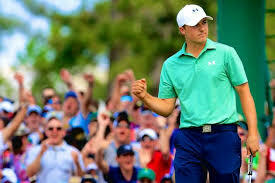 Spieth (age 20, result T2), Blixt (T2), Stadler (T8), Walker (T8). That’s four out of the top 13 finishers who were navigating these hallowed grounds for the very first time. Although there is something to be said for course knowledge, especially at a place like Augusta, these players clearly believed in themselves enough to take on the challenge. There was no intimidation factor. Never see your youth or inexperience as a problem to overcome – simply believe in yourself and in your preparation. Is there any greater pressure than on the back 9 Sunday at Augusta? Playing in front of thousands of people live (many of whom are just an arm’s length away from you), millions more watching on tv, in the one tournament you have dreamt of winning since you picked up a club. The player who wins in these trying circumstances is the one who has learned to embrace pressure as a privilege. There is a huge difference between a mindset that fearfully focuses on the stage or potential ramifications of their result, and a mindset that welcomes the opportunity to test themselves in the most challenging of settings. Pressure is the result of playing your way into a meaningful situation. It is the result of reaching the very situation that you have been training so hard for. Pressure is a privilege, and the great ones learn to love it.